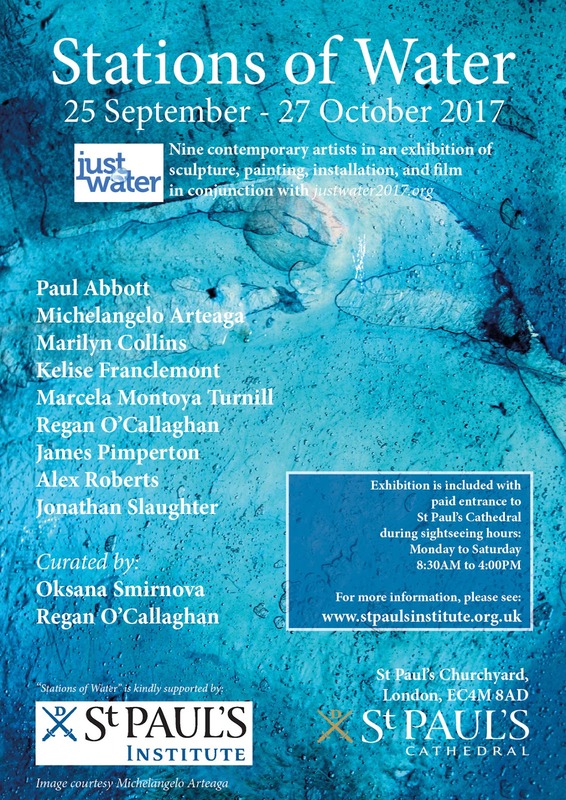 Stations of Water - nine artists have created site-specific artworks for a temporary exhibition at St. Paul's Cathedral; part of St. Paul's Institute's, Just Water 2017 campaign. As part of the international JustWater 2017 campaign, a group of ten Alumni from Chelsea College of Arts, London, UK working closely with St. Paul’s Cathedral's Schools and Family Learning Department and St Paul’s Institute will stage a project inspired by the theme of water. The nine artists and one curator come from the UK, Mexico, USA, Spain, Russia and New Zealand. Stations of Water will take place from 25th September through 28th October 2017, and is modelled on the liturgy of the Stations of the Cross. A guide will direct visitors to nine stations, which will all be inspired by water and themes such as religious rituals, access to clean drinking water, pollution, conservation, the privatisation of water, drought, and global warming. Each Station will be an installation of painting, sculpture, video, sound or light. Alongside the exhibition, the artists will work with the Cathedral’s Schools and Family Learning Department running art and education projects with visiting primary, secondary and further education groups.